Logosol’s popular DH410 2-sided planer/moulder gets several upgrades and closes in on the PH260 4-sided planer/moulder when it comes to design and performance. 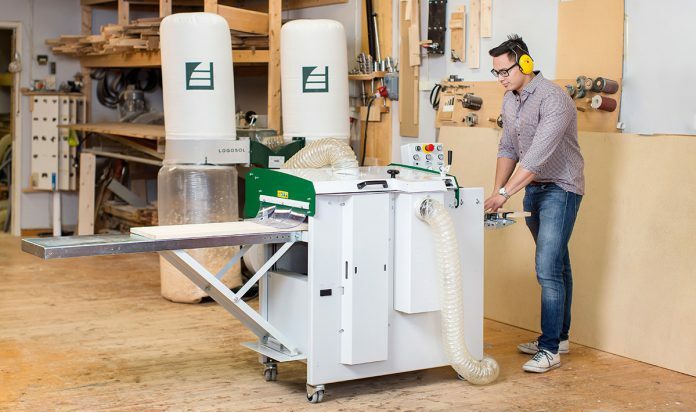 ”This o ers amazing possibilities,” says furniture maker Berth Olsson, who has done a lot of woodworking with the DH410 2-sided planer/moulder over the years. The DH410 already has the same sturdy construction as the PH260 4-sided planer/ moulder, with automatic feed and separate motors on both cutters. It’s a professional- grade pro le planer/moulder that is capable of producing tongue and groove, nished mouldings, and panels. The machine is used rst and foremost by customers who want to plane on all four sides and do not mind that the work takes a little longer. ”Many of them start with joists, panels, and beams and when they feel comfortable jump into wedged oorboards and more re ned countertops or tabletops,” says Mr. Olsson. The DH410 allows you to plane in wide swathes, even up to 410 mm. ”A typical customer order consists of sturdy, wide tabletops and countertops, and this machine is perfect for that,” says Mr. Olsson and shows a tabletop made of birch that he just made to order. The latest upgrades provide customers with even more advantages. With a feed table as a standard part of the package, the planer table length is an impressive 1270 mm. If you need an even longer table, the in- and out-feed tables from the PH260 4-sided planer/moulder also t this model. The new DH410 can also be equipped with a more powerful chip extractor. Several accessories that used to t only the PH260 now also work on the 2-sided planer/moulder, such as the pressure roller for easier and more exact feeding. ”The pressure roller is a fantastic accessory that’s ideal when planing longer materials,” comments Mr. Olsson. Logosol DH410 has a lot in common with our PH260. The machine is built on the same principles and most of its components are the same as PH260’s, which means that it is a very sturdy machine with a cast-iron machine table and separate motors for each cutter and the feeder. HSS, hard metal, groove knives? Woodworking Project.com is a web magazine for small-scale wood processing and forestry. You are welcome to reproduce articles and news, just remember to link to us! Contact us for pictures. Enter your email address to subscribe to Logosol newsletter! How thin can a board be?